I recently blogged about my mission to organize my craft room. Well Saturday I headed off to some thrift stores and found some great little goodies that will hopefully help me to make better use of my small space, I will post pictures later. While out, I found some great treasures which in conjunction with some great Amy Butler fabric have inspired this post. These are not all my ideas, but I am totally inspired by them. Hopefully they inspire you also. I will try to give credit where credit is due. 1-Embroidery Hoops I was so inspired by this idea when doing some research for my organization post. 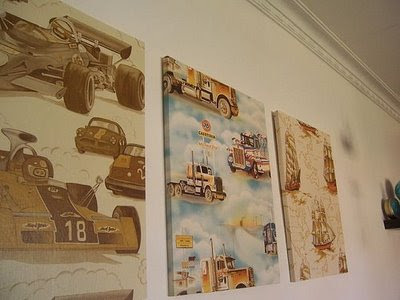 I think that it is such an easy and inexpensive way to display your favorite fabric. You can easily remove the fabric if you were to decide to use it for a different project, and you can add and subtract the number of hoops that you have on display. There are a number of different sizes of hoops out there, and we all know that repetition of shape with variation of size is a great way to make things cohesive and yet interesting. I purchased 4 hoops at 50 cents a piece at the thrift store...I think that I need at least 3 more. I kind of like odd numbers. 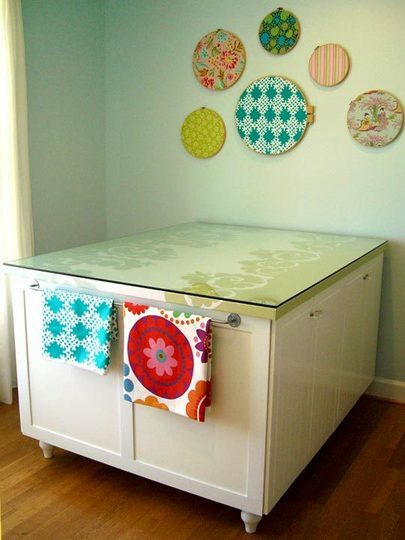 2-Put it under Glass I am not fancy enough to have a special cutting table like the one pictured above, but I absolutely love the pattern under the glass. I still am not sure if it is even fabric, but doesn't it look great? I think that if you were to use this idea in a work station it would be wise to use a fairly monochromatic fabric that is rather light in value-just so that it doesn't interfere with the work you are doing. I took this idea and applied it to my new filing cabinet. I cut a piece of my new fabric and pinked the edges (so I wouldn't have to bust out a machine). Unfortunately I don't have any glass in the right dimensions-I'll work on getting that later. I did manage to scrounge up a scrap piece of vinyl from my recent projects that will serve as glass until I can update it. 3-Paste it up I have yet to try this idea, but oh how I wish I'd known about it during my apartment days. It is a simple starch paste that you can mix up to make a removable adhesive for your fabric. Thanks Jessica Jones for the great idea-check her out at How About Orange. 4-Don't forget to Stretch There are so many great images out there for stretched fabric. I love the fact that fabric can be displayed as art-I mean it is someone's artwork right? Jessica Jones at How about Orange gives a great step by step tutorial on how to use stretcher bars to display your favorite fabric (check out her amazing fabrics while you are visiting). Design Dazzle also provides examples for inspiration. 5-Write on it This is a brilliant idea. 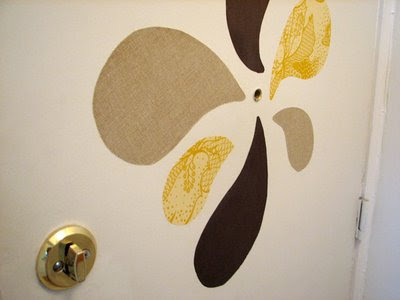 I need to buy more fabric so that I can make one of these for my craft room-I tried it with a piece of paper, but it is too high contrast. Once again I think that having a lighter value scale is important to this project. 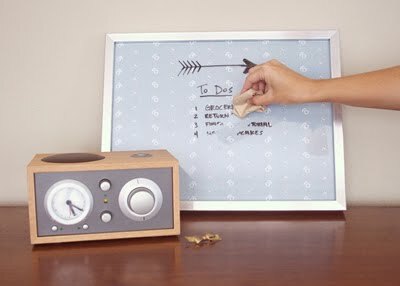 Check out the tutorial for this genius idea at paper n stitch-you should stay awhile because it is pretty inspiring. Well those are my top 5, no sew, inexpensive, quickies to decorate with fabric. wow! makes me want a sewing room!! ps: How much do you charge for a quiet book? I'd like one for the boys, so just name your price!!! Jess-I'll shoot you an email with a quote. Thanks for visiting my blog. Sometimes it feels like a ghost town...it's nice to know that someone is out there. Hi Tricia, I saw your link from How About Orange and like your "no sew" ideas! I thought you might be interested in my little online business - stretched fabric on canvas and cushions in bold designs. There is also fabric for DIY projects. www.moochdesigns.com.au. I noticed there haven't been many comments on here in a while. I just wanted to thank you for the time and dedication it takes to keep up such a great site!! Your ideas are amazing and I can't wait to start making a Quiet Book for my cousin's brand new baby. Thanks again!! !